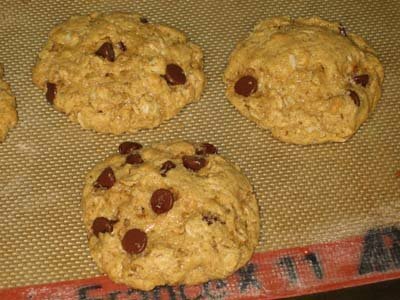 I’ve changed my mind and am going to post the vegan oatmeal peanut butter cookie recipe from Friday morning. 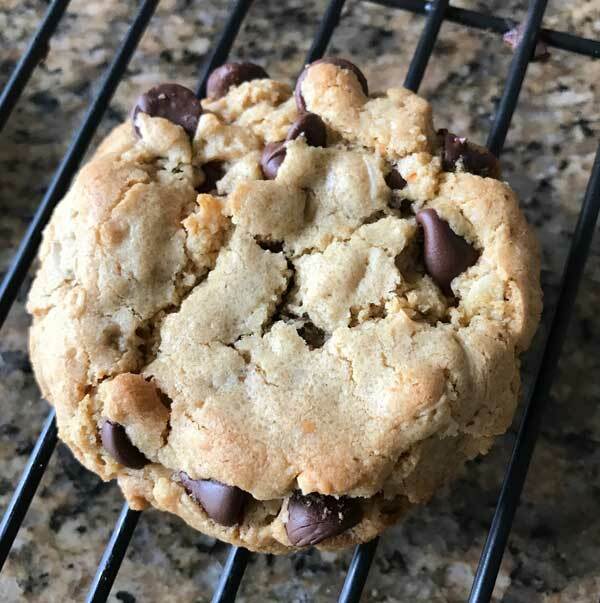 At first I thought the recipe wasn’t worth posting, but after eating the cookies for a few days and appreciating their extra-moist texture, whole wheat taste and sweetness, I’ve changed my mind. Fuzz likes them too, and she’s pickier about cookies than I am. So here’s the recipe. I left out the walnuts thinking that walnuts or pecans wouldn’t go with peanut butter. However, the way all the flavors come together in the cookies, the extra nuts would good. Preheat oven to 375 degrees. In a large mixing bowl, stir together first five ingredients. In a small bowl, thoroughly stir together flour, soda and salt. Stir into batter. Stir in oats and chocolate chips, followed by nuts if using. Drop batter by rounded tablespoonfuls onto Silpat or parchment lined baking sheet. Bake for 10 minutes or until set. Remove sheet from oven and let cool on tray for 5 minutes. Great recipe! I used sun butter, cut the sugar to 3/4 cup (partly altitude of 10,000 ft and partly just to make them healthier), spelt flour, and used sunflower seeds, coconut, and mini chips. Thank you! Thanks for the feedback! I haven’t made this recipe in a while. I’ll have to try it again soon. Hi Anna! I just made these cookies and they are beautiful. I was a little skeptical as I was scooping the dough; I was afraid the cookies wouldn’t hold together. I did use whole wheat flour instead of the pastry flour. Tasty treats! Thanks for sharing all of your recipes. I made these cookies for my family and they loved them. I doubled the recipe and followed it exactly as stated. These cookies are very filling with a great taste. Will keep this recipe for future baking! Thank you for sharing. Stephen, thanks for the tip! I have some tahini on hand and might try that myself. Somewhere on this blog there’s a recipe for oatmeal cookies with tahini and those are really good. I guess the tahini version of these has a similar flavor. These are great! I didn’t have peanut butter or almond butter, but I tried the recipe with Tahini and they still came out really delicious! These are very tasty cookies. Thanks for sharing your recipe! Anna, this has nothing to do with your Vegan cookies but I had to tell you I baked a double batch of your Chocolate Chip Cookies (from Epicurious) to take to a friend’s son’s graduation party. I had them on a huge tray and they were gone in 1/2 hour – 92 cookies!!!! I was browsing through your previous posts and found the recipe. I told a friend at the party all about your great blog. Thanks so much – they were delicious!